Renewable energy is the hot topic of the century. The demand for more earth-friendly and renewable energy sources can be seen in news reports every day. As the costs and questionable status of fossil fuel dependency continues to rise, it’s not only companies that are doing research for renewable energy, but it has escalated to entire countries making some rather major changes. Hydropower has been around since the first human built a dam. It has been estimated that approximate ten percent of the energy used in the United States could be accommodated through the use of hydropower. This renewable energy is not just for dams, but involves wave and ocean energy as well. In the past, there were fewer companies and products that really looked into hydropower as a renewable energy source, but this is changing rather quickly. Wave power is being used with such projects as the newer ‘sea snake’ in Scotland. Tidal power is now being used in many of the coastal areas of the U.S.
Wind power started out as part of the top renewable energy sources, but has more recently been hitting some problems. The major hurtle to overcome has been what is referred to as ‘local congestion’. 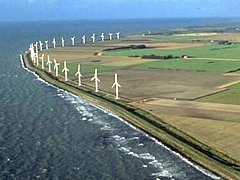 This is a situation where enough wind is available, along with wind power generators, but the area is lacking in the ability to distribute the energy. The State of Texas has been experiencing numerous problems with the ‘local congestion’ problem. Other states and countries, however, are continuing to use wind power and making attempts to address the ‘local congestion’ before it becomes a problem. The country of Brazil is a perfect example of wind power done right. Solar energy has been around for a long time. In the 1980’s, the U.S. government offered incentives for the private citizen to adopt solar energy as a renewable energy source for their homes. Unfortunately, the cost was so high and the technology so new, that very few people adopted solar energy. Solar technology has improved by leaps and bounds, but unfortunately, the cost is still prohibitive. Many citizens (94%) believe that we need to adopt renewable energy and would be willing to buy into it, if the cost was less. Well, the U.S. Department of Energy has developed a plan to accomplish just that. The ‘SunShot Initiative’ is a goal to reduce the costs of solar energy by seventy five percent by the year 2020. While Brazil has been a leader in wind power as a renewable energy, they are now entering the playing field to add solar energy to their incredible successes. A company called Twin Creeks is a new plan to reduce solar energy costs by removing much of the pricey figures by removing much of the costly start up charges. Geothermal energy is expanding, but not without some difficulties. The process uses ‘fracturing’ (also known as fracking) and has come under some rather major objections. The purpose is to locate and drill into the natural hot water sources underground and pump the water back to the surface for use as steam to convert to energy. While there are some states that are no-brainers for this (i.e. : Arizona, California, Nevada, etc), there are other states that are looking into geothermal energy. Research, resources, cost and application are all part of the major factors that are needed to implement renewable energy. The U.S. and now most of the world realize that the continued use of fossil fuels are not only a negative effect on the earth, but are no longer cost effective. We must stay tuned to continue the story on renewable energy. Posted on August 9th under Renewable Energy Sources.